My 2007 Norge rear suspension has never been touched to my knowledge, it has 37,000 miles on. I’m looking for help from you experts about how deep I need to go to find and fix the known issues with lack of grease and any other issues that need to be attended to. I’ve got the shop service manual, thanks to who ever posted the link to cadre cycle. What I need to know is what special tools do I need? What parts will I destroy and need to replace doing the service. The manual mentions a hook spanner Is necessary ( which I don’t have ) and that a clip,seal,and bushings will be destroyed getting into the bearings. I have a good shop set up,probably most of the tools,the time, and the naive confidence gained by successfuly crabbing the frames and restoring the clutch plates on a 2004 Stone and my 2003 EV, and doing all the sorting out necessary to keep those 2 as well as our other bikes running. So I’m looking for help, guidance, and a little encouragement that I can tackle the Norge rear end issues. Thanks for any suggestions, even if they are to take it to a shop. Some way of holding the back of the bike up from above or with a bit of creativity you can do it off the centre stand. Let me know if you're thinking of doing this and ill explain how i did it. Tris thank you very much for the reply. I included a link to the excellent step by step pictures of the process Leafman66 produced. Thank you Leafman, (CRAC Swing arm service for dummies ) more properly referenced by Lannis as Stelvio Swingarm Service post just in case someone else stumbles across this. I have the good fortune of not only having a HB bike lift but also a very heavy duty ceiling mount bracket which with the help of a heavy duty come along can safely lift over a 1000 lbs, it came in very handy with crabbing the California’s frames. What I don’t have is the Castle Nut tool or a adjustable hook wrench. So this job may have to wait another week or so. Thanks for your encouragement and reference. And as always thanks to the Wild goose members who take the time to contribute their expertise. Anyone know for certain the size of the Castle Nut tool. The shop manual just lists a special tool # and I didn’t see the size referenced in the Leafman66 post. My local NAPA has Castle Nut sockets on hand but I need a size. Guzzi tech has them for $34.95 with out size reference, time or cost for shipment. I'd suspect that at 37,000 your rear shock is completely consumed and in need of replacement. Be careful not to dislodge the seal on the right hand (throttle) side, when you slide the pivot pin back in. There’s a solution if you need to hear it. 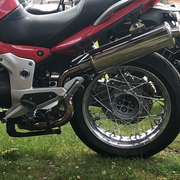 Also, remember the needles in the rollers are not caged..
thanks for the heads up on the uncaged needles, I’ve ordered a Castle Nut socket from Guzzi tech to do it right. About the shock, really 37,000 would need replacement, Most of the miles I’ve put on are solo,and only a few 1000 mile trips loaded. I don’t know about the first owners loads, but the second owner only put 2000 miles on in 3 years, so while I did ask in the original post about what needs to be addressed, I didn’t expect the shock to be suspect. The Nitron shocks and others like Weber’s I’ve looked at seem to start around $699 and go sky high from there. I love the way my riding abilities seem to have improved riding my Norge compared to my EV, which was a great leap from my Yamahas, but at my current skill level, my tires when changed have a lot of tread left on the sides, so I’m not a knee dragger, even in my most wildest imagination at 65 I don’t see much change coming there, unless I hit the big one, retire early and devote my life to ridding. So I’m wondering about the cost effectiveness of investing in an expensive upgrade that I may not even notice. Any thoughts, suggestions, Arguments relative to this point would be appreciated! I beg to differ slightly Huzo - it can be done but ONLY if you do some prep work. I never thought to do that Tris..
Good one, next time I will. It's not really a matter of turning your Norge into a MotoGP bike. A worn out shock is just that-worn out. I'd think you can get a Hagon made for less that 600 bucks. Be sure to get the remote pre-load. Or, Hamlin may have a take-off OEM for you. It's worth a call and he does so many shock upgrades he may very well be able to assist. But, going so far as to take everything apart it seems senseless not to address the issue. Especially if you're going to ride the bike and keep it for a while. Crappy shocks wear out components, compromise comfort, and wear tires faster. You might also look for a rebuildable take-off and have the guts rebuilt. I understand the sensible logic of not having to redue maintenance, after all I’ll be in there and it won’t add much time. But I question the necessity, maybe I haven’t been paying enough attention to Norge posts here,but I haven’t seen any posts regarding 07 Norge shock failures. Please correct me if I’m wrong on this. I’ve had the bike for 5 years and put on around 15,000 miles on it, I haven’t noticed any appreciable decrease in handling or performance. Again I’m not an overly aggressive rider,so it’s entirely possible the performance was not all it could be from the beginning. The Norge was such an impressive upgrade to my EV that it didn’t occur to me that the ride could be improved even more. So I’ll take your advice and look into it a bit more. Are you (or any one reading this) aware of a bench test one can do to check function? Also you mentioned Hamlin, do you have any contact info for him/them? Thanks for your response and input. We have probably 2 more weeks of snow to melt and cold weather before the roads are safe for ridding here, so I think I’ll have time to get a shock if needed. Hamlin Cycles. Google will take you to the web site. Jim will assist you. As for shock failure, or not, a few things happen. One, a shock will simply wear out. At 37,000 miles no question water, dirt, and grit have slipped past the seal. That rear shock lives in a very difficult environment. Next, performance degrades over time and is gradual. You may not really notice it. Third, the OEM spring rate was changed after your bike was built to improve the overall performance. That tells you the factory felt it could do better. As mentioned, refreshed shock(s) improve all aspects of the experience-you don't need to be a racer and by your response a simple refresh may very well suffice. Do you HAVE to? Of course not. Many don't. If I was you, and I realize I'm not, at 37,000 miles I'd ditch and replace the OEM as I'd be quite sure that's it's rubbish. Going thru what's involved to do the other work would suggest to me quite strongly to take care of all items serviceable while the back end is serviced. You don't have to and if you don't want to-it's all good. While we talk about the Norge, you should also know that the bodywork traps heat rather well around the rear brake fluid container. I've seen the fluid cooked on many occasions and, in fact, ruined mine in ONE brutal New England summer day in a traffic jam. It turned dark brown and smelled, and if you've cooked brake fluid you understand what it smells like. I'm certainly not the Oracle of Delphi for all things service, I just dislike doing things twice. YMMV. I guess I should be more clear. Shock absorbers do and will wear out. They all have a service life. Most times it's a worn out situation as opposed to a outright failure. I've only had one shock blow out-all the others wore out. Anyway, it's been good chatting and all the best! On the topic of rear shocks copping abuse through water/dirt ingress. I put a rear hugger on my ‘07 Norge and the shock does not get dirty. It’s barely visible behind the pipe/muffler on the left side. You are correct, sir. They help-alot. So do Shock Socks. Our friend her, though, is a bit behind on that, or those, as the case may be. Gentleman I now have time tools, and a brand new unused shock from a 2016 thanks to Jim at Hamlin cycle , $150.00 plus shipping, that’s Guzzi cheap. Now what is the technique for not messing up the bushing on the right hand side when I’m putting it all back together? I also ordered a shock sock which should be here unless the storm of the century messes that up. If I can get the cars out of the garage I’ll be tackling this Saturday between shoveling. Were suppose to be getting between 8- 12 inches. One day I’ll tell you the joke about getting 8-12 inches...! As for the seal though. I made a small bush that goes between the seal and the inner race on the throttle side. You need to ensure that there is an air gap between the bush and the race inner though, or you’ll be compressing the race against the seal when you torque the tapered rollers. Really, the bush is there so when you insert the pivot pin and it contacts the seal on the throttle side, it won’t fall arse over head out of it’s register. Do give the pin a good tubbing when you have it out though, they can be as tight as a fishes arse on occasions and if you clean it and apply some lube, it’ll slide in like a..
Huzo could you be a bit more descriptive about the details of the bush, could it be a large thin plastic or metal washer I might find at a hardware store? I’ve gone through the pics a couple times to familiarize myself with the process, perhaps it will become evident when I’m actually taking the thing apart. Yeah it could be the requisite number of washers glued together if you like. It needs to be an inside diameter to loosely slide over the small end of the pivot pin. Outside diameter about 1/4” bigger. Thickness, whatever space exists between the seal and the race, minus about 20 thou’. When I pulled the pin the first time to sweep out the dry, rusty and wretched remains, of what was once a set of tapered rollers, I noticed the mangled remnants of the “seal” that had been bashed into the register in Mandello, then Liberace’d by the pivot pin upon assembly. So in effect, it never had any seal for the first 90,000 k...! Actually, the shock was one of the things (thankfully) upgraded by Mandello between the 2007 and 2008 models. The 2007 shock was less capable than the one fitted to all later years of the Norge, and couldn't begin to deal with two up or a full load. Even that upgrade wasn't enough, and many Norge owners have gone aftermarket for both the shock and for one or another of the possible fork improvements. My stock shock lasted 22,000 miles before it became bouncy as all **** - and I have used an aftermarket unit ever since, with excellent results (140,000 miles now).